Supply guests with a sturdy utensil. A great addition to culinary gatherings, large and small. Utensils Type: Teaspoon; Material(s): Plastic; Color(s): White; Grade: Heavyweight. Product can be recycled where proper facilities exist to collect and recycle food-contaminated paper and/or plastic products. INNER PACKAGING: 10 Packs Per Case. 100 Spoons Per Pack. 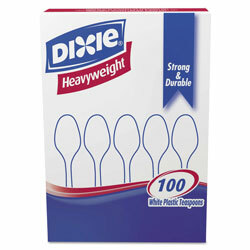 White Plastic Spoons from Dixie! 2054 In Stock today.